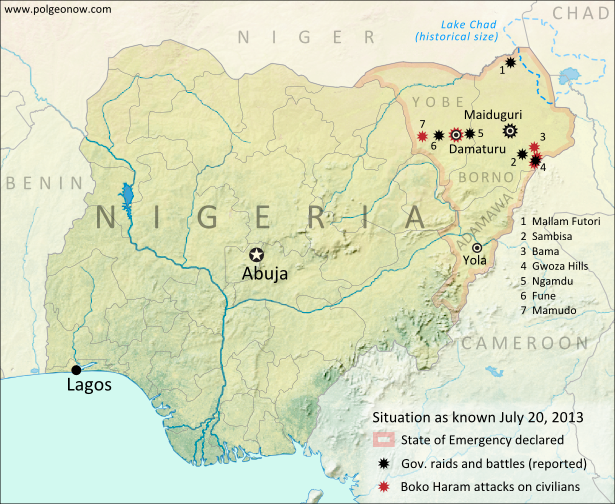 Boko Haram has now allegedly teamed up with the Islamic State, but the Nigerian rebel group has recently lost most of its territory to a multi-pronged military campaign involving Nigeria, Chad, Niger, and Cameroon. 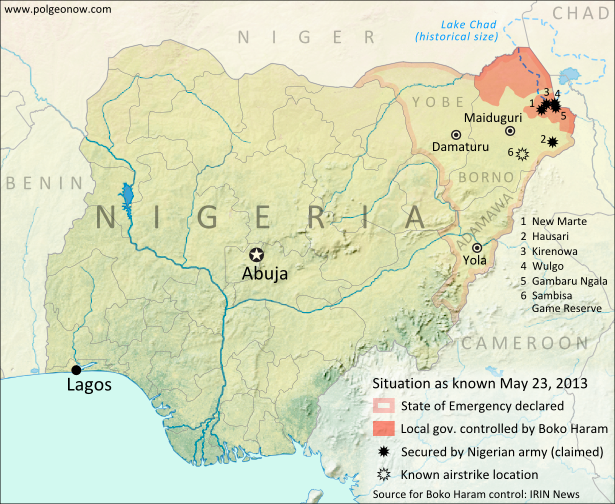 This map report illustrates the offensive against Boko Haram and the rebel group's remaining territorial holdings, and includes a summary and timeline of events since our previous Boko Haram map report in January. 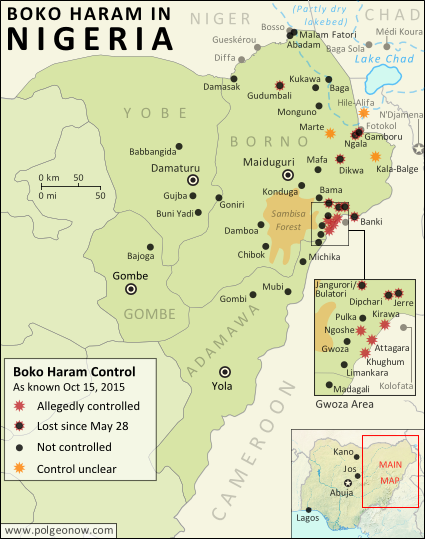 Map of Boko Haram's overall area of control in Nigeria, updated to March 22, 2015. 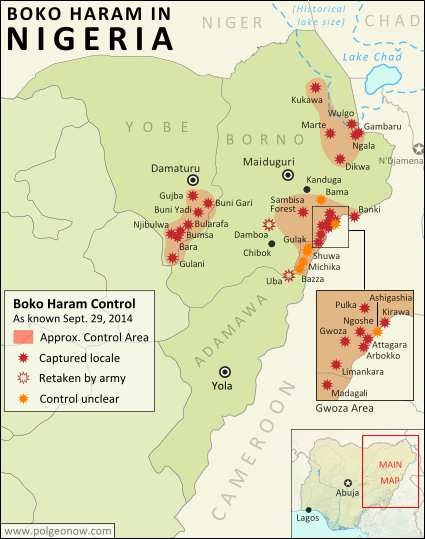 Detailed map showing almost every individual town currently or previously held by Boko Haram, as well as the overall extent of rebel territorial control. Illustrations of the five major military campaigns that have driven Boko Haram back over the past two months, as well as key locations in neighboring countries. 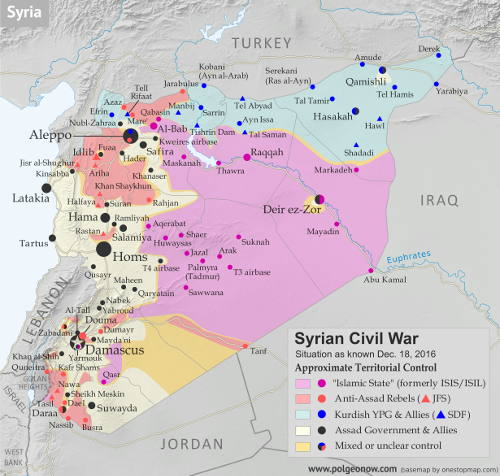 Summary and detailed timeline of territorial changes and major events since late January, with links to sources. Categories: africa, boko haram, cameroon, chad, conflict zones, divided countries, isis, niger, nigeria, premium, rebel control, the "islamic state"